There are many diets that can help with the symptoms of kidney failure. A vegetarian diet is one of the most popular diets that has shown to slow the progression of kidney disease as well as help patients feel better. 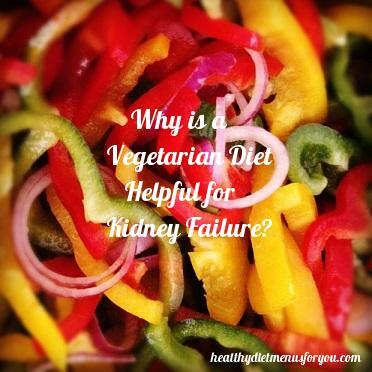 There are many reasons why a vegetarian diet is helpful for kidney failure as well as many other health complications. For kidney failure patients, they have to be careful about their protein intake. Plant based protein is easier for your body to absorb and process. It is recommended that two thirds of everyone’s protein intake come from high quality plant sources. Animal protein can sometimes be harder for your body to process. This puts added strain on your already overloaded kidneys which can be dangerous and exceptionally uncomfortable. White many plant based foods (such as beans, dairy, and nuts) are high in phosphorus, you might find that a vegetarian diet can help you keep track of and regulate phosphorus levels. This is because many processed foods and meats contain added phosphorus. Plant based phosphorus is also easier for the body to process than phosphate additives found in many other foods. The fact is that people who follow a healthy and primarily plant based diet are healthier overall. They tend to have higher levels of necessary vitamins and minerals. Multiple studies suggest that a plant based diets, if introduced early in the progression of kidney disease, can significantly slow the progression of kidney failure. Even in the later stages of kidney disease, a plant based diet can help relieve many symptoms and help to slow further progression. As many progressive health conditions are often connected to or present with others, there are even more benefits associated with a vegetarian diet. This is because research shows that a vegetarian diet can lower bad cholesterol, raise good cholesterol, stabilize blood glucose levels, and help with blood pressure. All of these conditions affect the body in ways that contribute to kidney failure. Many patients can see the benefits of a vegetarian diet for kidney failure and a multitude of other serious health conditions, but are not ready to make the leap into a completely vegetarian diet. While eliminating many processed foods and meats from your diet and replacing them with plant based options is absolutely the best thing to do, understand that even little changes can go a long way. Start simply, by making your portions of meats and processed foods smaller and increasing the portion sizes on your plant based. Have one day a week where you eat vegetarian all day, and then increase those days slowly as you get used to the new diet. Look for cookbooks and online tutorials on what and how to cook vegetarian meals if you are unsure about what to cook. You might be surprised how delicious and satisfying a vegetarian diet can be. A vegetarian diet has shown to be one of the most progressive and beneficial diets for chronic kidney disease and kidney failure. In fact, plant based diets such as this have shown not only to aid with the symptoms and discomfort of kidney disease, but has been proven to actually slow the progression of kidney failure. These facts alone make a vegetarian diet for kidney disease worth trying. Still have more questions about kidney disease or how a vegetarian diet is helpful for kidney failure? Check out my sister site RenalDietHQ.com. Don’t forget to leave a comment or suggestion. I look forward to hearing from you. How Do Phosphate Binders Affect Blood Phosphate Levels? This Season I Am Thankful For Fruits and Vegetables.